Wearing A Pink Dress In a Field It Must Be Summer! Well what else do you wear to prance around in a field full of wildflowers? A pink dress thats what, preferably one with pompoms on the sleeves and a bow at the back. Tick, tick! …what else do you wear to prance around in a field full of wildflowers? A pink dress thats what…! This dress is absolutely perfect for this beautiful weather we are having in the UK at the moment. Loose, crinkly and cool, you can wear it anywhere, anytime. It has some pretty details too! …we did our usual Sunday evening ‘thing’ a quick outfit photoshoot for the blog and then a drink at the nearest pub. 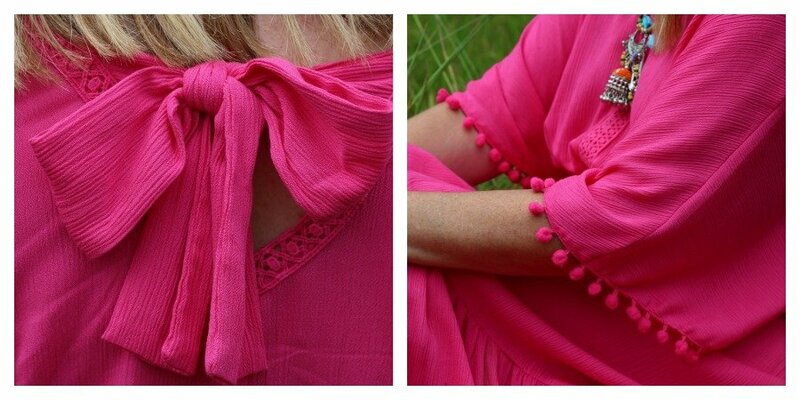 Every summer dress needs subtle details…a big bow at the back and a pom pom trim on the sleeves, perfect. An accessory match, made in heaven, with this dress don’t you think? Lightweight, pretty, did I mention there are pom poms? It actually has a chain strap too, but I tucked that inside for these pics. If you want to know more click through and have a look… if not scroll on to the last ‘pink dress in a field’ image. Pink Dress: in sizes 10-32 J D Williams. 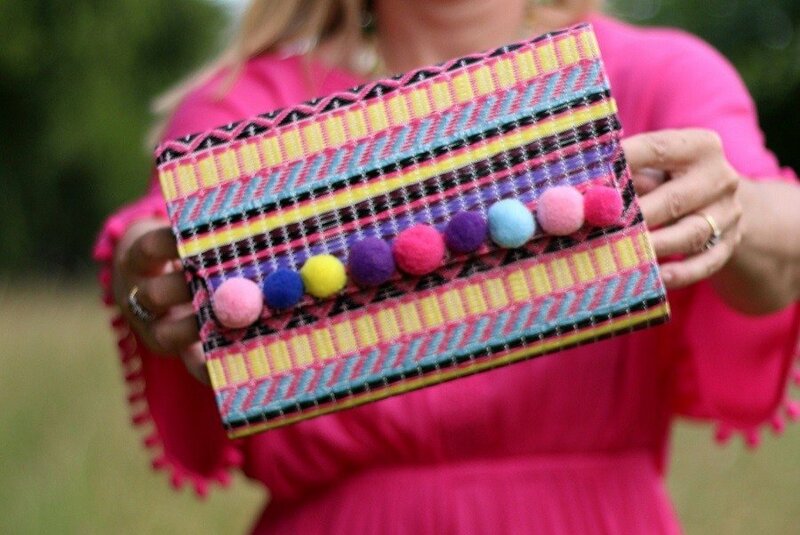 Pom pom Bag JD williams: (sold out) but I’m loving this tassel clutch for everyday use only £7.50 ! One more ‘prancing in a pink dress’ pic? Linking to Catherine’s #IwillwearwhatIlike link up this week! Have a great week…it’s another hot one yippeee! Dress, shoes and bag all gifted and I love them! Previous Post Triumph Support Comes in Different Forms, Shapes and Sizes! This is my most favorite outfit on you ever. Such a fun fuchsia maxi dress and I love the clutch too. Great field of flowers too. Such beautiful photos. Your collaboration theme sounds like lots of fun! Thank you Carolyn I was trying to do justice to this very pretty dress! Such a cute outfit. Love the bright pink and that clutch is great! Thank you very much Julie! both are perfect for the heatwave we are having in the uk! That is definitely one beautiful dress…and perfect for prancing through the wild flowers! Thank you for joining us at the Ageless Style Link Up! Now this is my kind of dress, honey. The bright and happy pink color is your friend and the pom fringe is absolutely fabulous. Jonet thank you so lovely to have you comment on here! When I saw this breathtaking shot on Instagram it blew me away! You are an angel for saying that! and coming from you a true compliment! You look amazing in this dress!! I just bought one the same color, and you’ll see it on my blog next week—LOL!! You sound just like us that we go out to eat/drink after our photos—-gotta celebrate somehow!! I look forward to seeing it very soon everyone looks good in pink! hopefully we will be enjoying the dorset sun together with you and D soon? Oh that dress screams Summer! What a wonderfull color! And those sandals!!?? ?love them! Enjoy the sun! Thanks Nancy, such a shame the sandals have sold out! I love that dress on you Ashley. Fab floaty photos. I keep looking at it the same dress on the JDW site. I had no idea it had a bow on the back … how did I miss that? I love those sort of details. ? Thanks Sharon it was the bow that did it for me too!